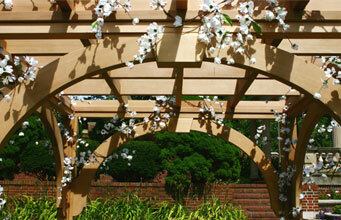 The Taft is a traditional flat top pergola with formal style rafter tails and keystoned arches. Our unique bracketing system of arches creates a very stable structure that can be erected quickly and remain stable in any space from an open field or beach to a hotel ballroom or backyard. Five feet wide and deep, these structures provide ample space and a perfect focal point for the bride and groom. Make a personal statement with the addition of vines or flowers, or drape shear fabric over the top and let it flow to create a canopy. Easy to transport and install for permanent use after the event, these structures can be used and appreciated in a number of different ways. 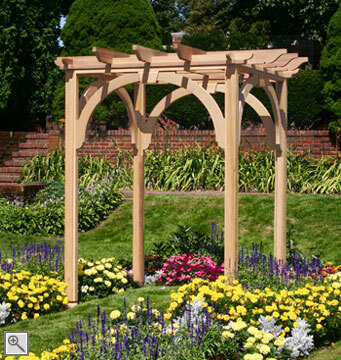 In a garden, on a patio or rooftop terrace, these small pergolas can be used to create an intimate setting, define an entryway or accent an expansive space. 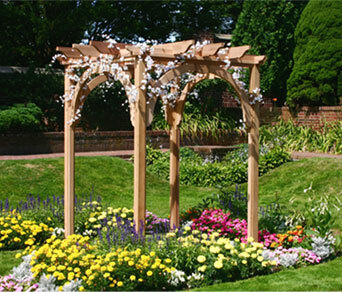 Beautiful, durable and versatile, your wedding arbor remains a permanent memento of your special event, yours to enjoy for years to come. Constructed of western red cedar and stainless steel fastenings. 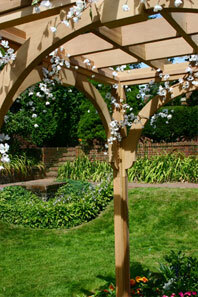 This structure's standard size is 5'x 5', but can easily be lengthened to anywhere from 5' x 6' to 5' x 9'. Call for pricing for changes to arbor width.